Here inside Argentina canyon, in the Lincoln National Forest and near the 4 spring heads that feed Rio Bonita, the EAR1 Rain gauge collaborates with the creek flow to create a cascading cadence. In these Desert Mountains this is always music to the ears. This creek is flowing at an elevation of about 8,000 feet at this location. This exploration with the EAR1 Rain Gauge has caused me to think about how the flow of the water, sets the meter for the sound. A rhythm is forged through a combination of the steady flow vortexes and the variable creek bed surface. Occasionally the Rain Gauge strings are plucked by traveling sticks, water bugs, leaves, and blades of grass on their journey down stream. The mood of this piece is tempered as it is early fall. Spring showers will surely bring a much different composition. It occurs to me that if I were to listen often to this stream, or any stream or river, I could eventually become adept in hearing the seasons, the annual rain fall, and maybe even the temperature. I would be able to hear the metadata of this stream and the environmental composer that created it. The Spanish Explores in The 16th century called this extensive lava flow malpais (badlands). The river of lava that flowed down this “Valley of Fires” erupted from a volcano 7 miles from where this EAR1 remote station listened. The eruption is fairly new, as it took place about 1000 years ago. Extending through the valley for 44 miles, the malpais averages 3 miles in width. The ropy type of lava is called “pahoehoe” Valley of Fires is located in the central southern region of New Mexico, near Trinity Site. This Remote Station instrument picks up the winds swirling through the lava beds. The three cello strings are tuned to three part harmony. The clarinet faintly interprets with breathy melody. Devil’s Inkwell is the smallest of the 9 lakes, at Bottomless Lakes State Park in eastern New Mexico, with a surface area of 0.36 acres (1,500 m2). It gets its name from the dark color of the water which is caused by the steep sides of the cenote and algae growth within the lake. Of course the Devil’s Inkwell is not bottomless, however it is about 30 feet deep, which is quite deep considering it’s surface area. This place is an oasis in the desert. Seven of the lakes are protected, although in recent years the lakes have been contaminated by trash that has been thrown into the lakes by careless visitors. On this sunny October day, the temperature was about 80 degrees, there was a light breeze, that the Remote Station Vio recorded (the sound you hear in the video). As the day’s light changed so did the surface color of the inkwell. The visual rhythm created by the wind fell perfectly in sync with sound to form my perception of the place. In August, of 2013 I ventured into downtown Boston, and to the shore of Boston Harbor’s Revere Beach with the Remote Station. I wanted to explore the urban and coastal environments. The city was teaming with sounds and activity of people rushing about. On my trip to the beach I backpacked the Remote Station, as the cello case that the sculpture fits into has straps for such a purpose. It became very apparent to me, through a terrific back ache, that the 50 pound sculpture was a bit much to walk miles with, so I fashioned a mobility system from a broken dumpster dive grocery cart. The Beach was a beautiful and surreal setting. I found the sound through the Remote Station to be quite appropriate for the environment. The following documentary of my installations reveals the various places I traveled with the remote station, including the The Boston Museum OF Science and the DeCordova Sculpture Park and Museum, along with the sound it captured in these places. At each location I was met with enthusiastic and curious viewers. I logged about 50 to 100 conversations a day, I found it it interesting how the conversations varied from place to place. It was equally interesting how so many people walked by the odd installation without even noticing it – as if it were invisible. The EAR1 Project Through The Portal, November 2013 is a solo exhibition presenting work from the EAR1 project. The Exhibition includes Sculpture, Sound Photography, Video and Interactive elements. (Earth Aural Rover) is an interdisciplinary as well as a multidisciplinary art project. I began the project with studies in neuroscience, language, psychology, ecology, and music. 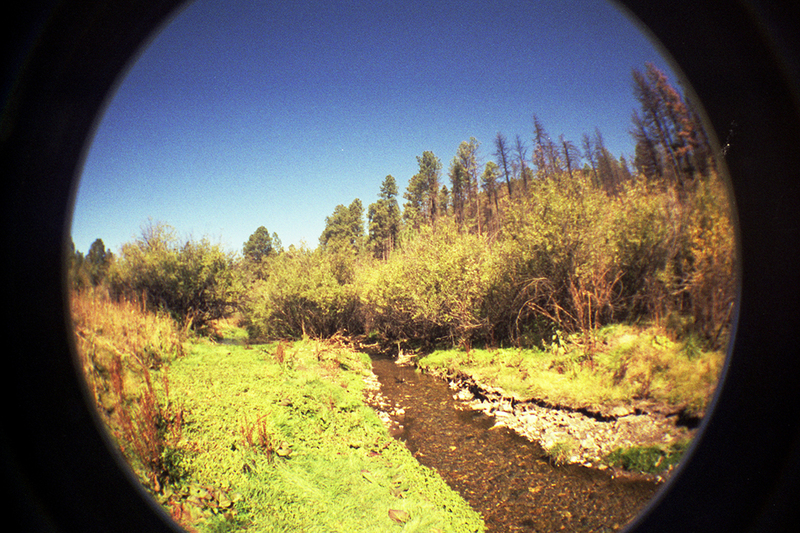 The “Portal” as depicted in the Lomography Fisheye photo prints is a devise that serves as a visual representation of the altered perception I’m exploring. It is much like a portal would be in an airtight vehicle traveling through space. It is built into Mission Control, and I have been capturing images of the places I explore. It is through the language of music, both visual and audio, that I feel an alternate perception of our environment might be forged. Music provides me with a vocabulary to initiate dialogue with the science community toward the goal of synthesizing ideas about how we perceive environments.